This is the second of Agatha Christie’s novels, and the first one with Tommy & Tuppence (none of which I have read before). It’s a cute setup with potentially adorable T&T making their debut. He’s kind of laid back and she’s courageous and plucky. As for the plot, well, all the way through, we’re pretty sure that one of the two characters who join forces with our detective duo is the mysterious villain incognito but Christie manages to keep us guessing right to the end. It feels a bit contrived and forced at times, but overall an enjoyable read. 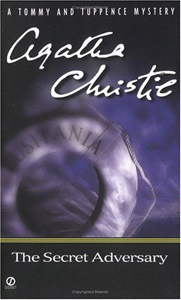 Looking forward to the next Christie mystery, Murder on the Links, the second appearance of Hercule Poirot.